Since I had some time on my hands the other day and e-bay is open 24 hours a day, I threw a few shekels away a week ago on a batch of old postcards. Included in the collection was a black and white card with a photograph of an older building and the caption "Chicago Cobb Divinity." It turns out the the building in the photograph still stands on the University of Chicago campus. It is named after Silas Bowman Cobb, another one of those early Chicagoans who came to the fledgling city with nothing and left this earthly coil rich, rich, rich. 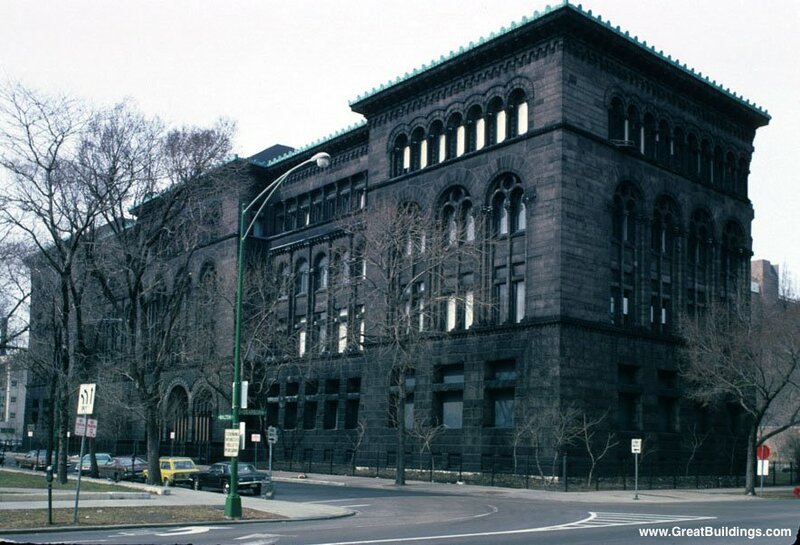 The building still stands as the Silas B. Cobb Lecture Hall at 5811-5827 South Ellis on the University of Chicago campus. It was designed, fittingly, by Henry Ives Cobb, who was no relation to the benefactor, but who did design the original plan for the brand new university in Hyde Park. When he designed the plan for the new university, Cobb was just about 30-years-old. Cobb, the architect, brought the Romanesque and the neo-Gothic styles to the new campus as well as to other sites in Chicago. You can walk between three of them -- the Excalibur, the first home of the Chicago Historical Society, up on North Dearborn, Harry Caray's place on West Kinzie, and the Newberry Library on West Walton. Cobb, the benefactor, provided $150,000, one fourth of the sum that was to be raised independently for John D. Rockefeller's $600,000 university endowment to take effect. On that same day he wrote the check for a hundred fifty grand, Cobb added $15,000 so that the new recitation hall, the present Cobb Hall, could be finished. It was the first academic building on the new campus. The building opened on October 1, 1892 with over 60 rooms, including a chapel, a large lecture hall that seated 200, and offices for the new university's president, William Rainey Harper, as well as offices for the school's deans and other officials. But the real story is the story of Silas Bowman Cobb. Born in Montpelier, Vermont, Cobb was apprenticed three times by his father before he was 17-year-old, to a shoemaker, a mason and finally to a saddle-maker. The first two occupations fell through, and it seems the elder Cobb took his youngest son aside and told him he was on his own. In 1833 the boy started for the west, to a small settlement he had heard was called Chicago. He had half of his stake stolen somewhere along the Erie Canal and when he arrived in Buffalo, he had only seven dollars remaining. He bartered with the captain of a lake boat who agreed to give him passage if Cobb surrendered his remaining cash and provided his own food. The young man bought six loaves of bread and a preserved ham and slept on the open deck. Bad weather extended the normal three-week trip to Chicago to five weeks. It's reasonable to assume that the ham sandwiches didn't last the whole trip. Of course, in those early days there was a sandbar across the mouth of the river, and ships anchored a half-mile or so offshore while passengers and cargo were transported to shore by small boat or canoe. The trip to shore cost three bucks. Cobb had no money left and was held aboard the ship for three days until a returning passenger lent him the three dollars. Cobb set foot in Chicago, a hamlet of some 200 residents, on June 1, 1833. Cobb's first efforts in his new home were spent earning enough to repay his benefactor. You can guess what happened. More rain . . . three days of it. He reached the Des Plaines River, twelve miles from Chicago, to find it running so deep that he couldn't cross. He tossed the wood off the wagon, turned the oxen loose to find their way back to Plainfield, and waited until better weather to get the wood back to town. Somehow the hard-luck kid managed to get a two-story structure built, begin a harness-making business, and in 15 years sold the business for a good profit. During that time Cobb and four others became the first fire fighters in Chicago, signing on as members of the Pioneer Hook and Ladder Company. In 1839, scraping what little money he had together, he purchased two lots at the corner of Michigan Avenue and Lake Street for $516. That corner is worth considerably more than that today. By 1848 he ended up on the Board of Directors of the Galena and Chicago Union Railroad, the first railroad to run out of the growing city. 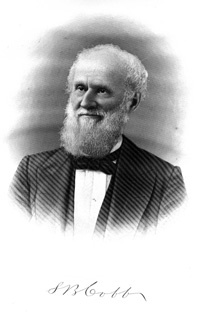 In 1852 Cobb retired from mercantile operations, and by 1855 he had been elected President of the Chicago Gas Light and Coke Company, which subsequently became the Peoples Gas Light and Coke Company. Sound familiar? He was one of the principal capitalists when a number of street railways were consolidated into the Chicago City Railway Company, serving as director when the cable system supplanted the horses. Cobb moved his residence several times after his purchase of the property at Lake and Michigan, finally building a home at 979 Prairie Avenue. Today he would have a nice view of One Museum Park Place, but back in the day he overcame the bad luck of his early years and escaped the ravages of the Great Fire of 1871. Although his properties in the center of town took a beating, his residence escaped the flames and he quickly rebuilt his real estate holdings. No anecdote about the aging Cobb that I have found illustrates his character better than this. A young banker in the city who was at the time only making 50 dollars a month took his lunch at a cheap restaurant where patrons sat on stools in front of a long counter. Next to him sat an elderly gentleman who only seemed able to afford a doughnut and a cup of tea. Since they met almost daily, they fell into the habit of daily conversation. Then came the day when the young banker, learning that he had received a raise and would soon be receiving 75 dollars a week, informed his lunch buddy, "I am afraid we shall not continue to lunch together. I have received a raise in pay and I am thinking of going to a restaurant where I can sit in a chair at a table with a table cover on it." "Let me advise you not to do it," began the older lunch mate. "Continue to economize; save your increased pay; live simply, and when you become an old man, you may be a rich one." So there you have it. Silas Bowman Cobb . . . a man who had to borrow money to disembark the ship that brought him to the dirty swampland they called Chicago, a town that had at the most maybe 300 non-native residents. He worked diligently, never borrowed more than 600 dollars and never for longer than six months, and like the great city that grew along with his fortune, surpassed all expectations. It might be a fun trip sometime to go out and see Cobb Hall at 58th and Ellis, a legacy of the harness-maker who made it big. Cobb's story is the story of Chicago. This was facinating. Love the fact you sent for postcards and included these as part of the photos for your story. I loved your story. Silas Bowman Cobb is my great, great, great uncle. His eldest brother, Edwin, was my great, great, great grandfather. You are a very good storyteller. Like the anonymous post of March 9, 2011, Silas Bowman Cobb is my great, great, great uncle. His eldest brother, Edwin is also my great, great, great grandfather. Silas is my great, great, great grandfather. Cobb is my middle name. Sounds like we're related.